Don't Fold—You've Got the Winning Hand! Have you ever upgraded your Power Mac by installing a PCI ATA adapter card and new hard drives? If so, you know the challenge of trying to get the cables to reach all of the drives without interfering with anything else. Sonnet simplifies the task with Tempo™ ATA/IDE cable kits. Each kit contains two custom-made cables built specifically for late-model Power Mac computers. With connectors in the right places and folded so you don't have to, you can actually connect up to 4 additional hard drives (try that with standard cables!) to your Tempo ATA133, Tempo RAID133, or Tempo Trio PCI ATA adapter card. Installation is straightforward. These cables are just right—not too long, not too short, and the connectors are where they should be—so plugging in the cables between the adapter card and the drives, then closing your computer, is the entire installation process. It doesn't get much simpler. Sonnet's Tempo ATA/IDE Cable Kits provide the right length of custom-made, pre-folded cables. 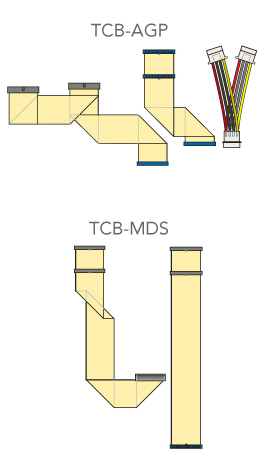 On the left is the Tempo ATA/IDE Cable Kit (part no. TCB-AGP) installed in a Power Mac G4 (AGP Graphics); to the right, ATA/IDE Cable kit (part no. 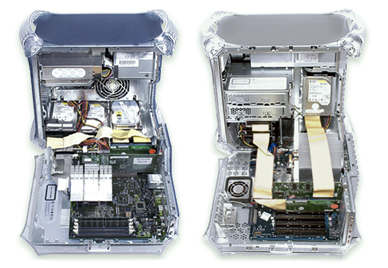 TCB-MDS) installed in a Power Mac G4 (Mirrored Drive Doors) desktop computer. Note: Supports 4 ATA-133 drives in Power Mac G4 AGP Graphics, Gigabit Ethernet, Digital Audio, Quicksilver 2001 and 2002. Supports 3 ATA-133 drives in G3 Blue & White and G4 PCI Graphics.